I have experience with image processing, but I am fairly new to GIMP. I was experimenting combining layers that have transparency, and the pixel values that GIMP computes do not agree with the equation I've seen posted on GIMP and photoshop web sites. Here's a specific example. The math here applies to a single pixel, but for convenience I'll assume that I have images with the same pixel value everywhere. Start with a 4-band image, where the RGB values are all 128, and the alpha layer is all 255, or as a fraction 1.0. Use that as your base layer. Now put on top of that another layer that has RGB values of 0 and an alpha value of 191, or as a fraction, 191/255 = 0.749. When those layers get combined in GIMP, I thought it was done mathematically using the following equation: output value = basePixel*(1 - topAlpha) + topPixel*(topAlpha) = 128*(1 - 0.749) + 0*0.749 = 32. That's not what I get with GIMP. I get a value of 66. Apparently I'm using the wrong equation. Does anyone know the answer? I should point out that the equation seems to work when the top layer is 255, but it does not work when the top layer is dark, e.g. 0, like in my example. 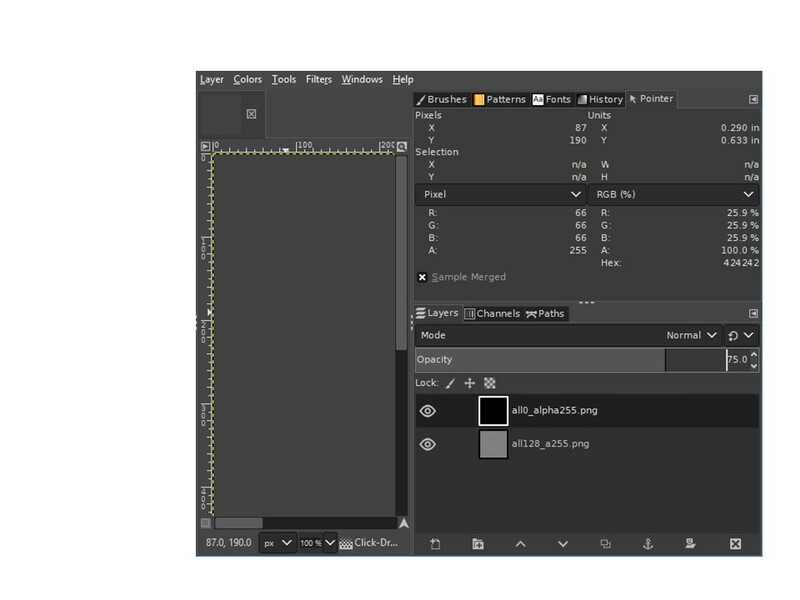 This suggests to me that GIMP is not using the equation presented above. The comments you made about Legacy, Default, and Gamma are foreign to me. It's not clear to me how they would affect the answer. And works as you report in 2.10 using Default Normal on a gamma image, which must imply a conversion to linear, then the composition, and then a conversion back to gamma. Not the answer you're looking for? Browse other questions tagged gimp layers transparency or ask your own question.